Why is a Llama Featured on Peru’s National Coat of Arms and When did it Originate? There are four variants of Peru’s national coat of arms. They are, the Coat of Arms per se, the National Coat of Arms or National Shield, the Great Seal of the State, and the Naval Coat of Arms. All four versions of Peru’s national coat of arms include the vicuña, because it is the national animal of Peru. 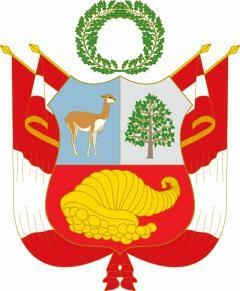 Peru’s national coat of arms features three images that represent the three kingdoms of animal, vegetable, and mineral. A cornucopia of gold and silver coins is on the bottom; the native quina tree is at the top right; and the wild vicuña, which is a type of llama, is to the left. The coat of arms is also the centerpiece of the Peruvian national flag. Llamas can be found on the backs of some Peruvian coins, as well, particularly the one-sol coin. The first version of the Coat of Arms of Peru was designed by General José de San Martín and officially declared on 21 October 1820. It consisted of a landscape of the sun rising from the Andes, seen from the sea, and had laurel branches tied with a golden ribbon framing it. How Did the Tradition of a Coat of Arms Originate and Does Every Family Have a Coat of Arms? What Language Do People In Peru Speak and How Many Official Languages Does Peru Have? Where does the term “Sack Coat” come from and What does Sack Coat mean?